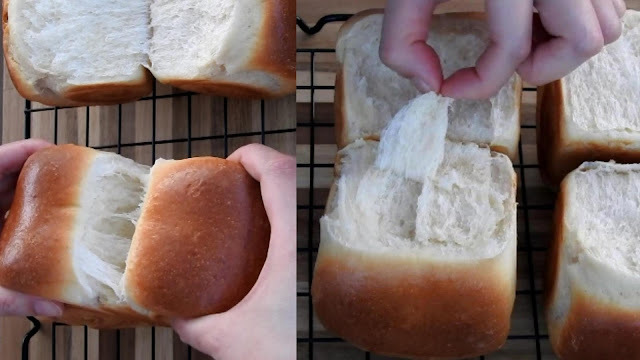 The softest, fluffiest bread you will ever eat. Using quick and simple milk roux method that keeps baked breads soft and keep fresh for a few days without adding any preservatives. I love my morning breakfast bread, that served simply with salted butter, smoked german cheese, fried eggs and ham. 1) In a frying pan or saucepan, heat milk, until the milk is warm to hot, then add bread flour. quickly stir until thicken and smooth paste forms to make a milk roux, then add cold milk, whisked egg, sugar, dried yeast, bread flour and stir. 2) Kneading the dough by hand, about 10 minutes. Adding oil a little bit at a time, push the dough up and down, beat until no longer stick to your hands. 5) Place the dough onto a baking tray and rise again for another 30 minutes to 1 hour in the warm place until double in sized. Ideal rise temperatures are between 35°C. If it's a winter day, the common problem is that dough won't rise. Using a warm oven by turn your oven on and off or with boiled water on the underneath to help your dough rise perfectly. 7) Remove from the oven and transfer to a wire rack.